Merezhka Poltavska is beautiful drawn thread embroidery from Poltava in Ukraine. Allow leading Australian embroidery designer and needlework teacher, Yvette Stanton, to be your personal tutor as she teaches you the basics and beyond of this historic Ukrainian embroidery technique. This full colour, step-by-step guide with over 300 clear diagrams and photos, will lead you from beginner to advanced merezhka stitcher. how to use your skills to create a variety of projects in this elegant form of Ukrainian embroidery. Chapter 1 helps you learn about the rich heritage of Merezhka Poltavska from historical examples of Ukrainian embroidery. It explains all the materials used to create merezhka, many of which you will probably already have in your stash! Chapter 2 is a step-by-step learning sampler, teaching the basic technique of Merezhka Poltavska. Most steps have text instructions, a clear diagram to show you what you should be doing, and a full colour photograph to show you exactly what it looks like. As a special bonus, there is information specifically for left-handed stitchers. Chapter 3 is another step-by-step learning sampler, teaching a variation on the basic technique. It too includes our three-fold method of instructions (text, diagram and photo), with the helpful hints and tips that you have come to expect from Vetty Creations' books. Chapter 4 uses the three-fold method for you to learn extra techniques, such as how to turn corners and how to make traditional Ukrainian embroidery hems. Chapter 5 has seven beautiful projects to practice your skills. The projects, ranging from large to small have varying applications, including a table runner, bookmark, bag, and a scissors case. With gorgeous full colour photographs, you won't be able to resist them. Each project has a large, clear chart with step-by-step instructions detailing preparation, embroidery, construction and finishing. With so much easy to follow information, beautiful embroidery has never been so easy to master. You will save so much time and effort in your quest to discover Ukrainian embroidery because Ukrainian Drawn Thread Embroidery: Merezhka Poltavska has all this information in one place. This book makes it easy to learn all you need to know, and shows you exactly how to do it. Ukrainian Drawn Thread Embroidery: Merezhka Poltavska by Yvette Stanton, provides a thorough course in a beautiful, historical Ukrainian embroidery technique, and you will refer to it again and again. Yvette Stanton is a respected Australian embroidery teacher and award-winning needlewoman. She particularly loves whitework embroidery. Yvette has written books on Hardanger embroidery and Mountmellick embroidery. Always searching for other beautiful whitework techniques, Yvette was introduced to the whitework styles of Ukrainian embroidery. In 2006, Yvette travelled to New York, USA, to visit the Ukrainian Museum of New York to further research Ukrainian embroidery, and Merezhka Poltavska in particular. She spent several days closely studying their beautiful collection of Ukrainian embroidery, and saw examples of many kinds, including Merezhka Poltavska, Nyzynka and Merezhka Zatiahanka. She found the experience incredibly inspiring and enjoyed asking many questions of the Folk Art Curator, Lubow Wolynetz, about the embroideries she studied. 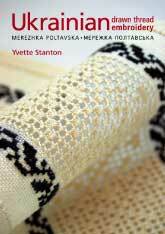 On Yvette's return to Australia, the knowledge she had gained formed the basis of her book on Ukrainian embroidery. Some of the examples of Merezhka Poltavska that she photographed at the museum are included in the first chapter of Ukrainian Drawn Thread Embroidery: Merezhka Poltavska. We'd love to hear from you about your experiences with Ukrainian Drawn Thread Embroidery: Merezhka Poltavska. Please send your comments to us. "The book is really unusual in its clarity of instruction, the drawings, the thought. I was moved to tears in reading in your acknowledgements your thank you to the people of Poltava for their gift of the poltavs'ka merezhka. Congratulations to you on a job very well done. To learn this beautiful style of Ukrainian embroidery, purchase your copy of Ukrainian Drawn Thread Embroidery: Merezhka Poltavska by Yvette Stanton, today. ﻿Purchase Ukrainian Drawn Thread Embroidery: Merezhka Poltavska today. Very soon you will be making your own beautiful Ukrainian embroidery!